For over a decade the not-for-profit sector has experienced a wave of growth that outstrips any other Australian industry. Turnover has risen by 40 per cent in the last six years to above $107 billion per annum. Assets now top $175 billion and the sector employs over one million Australians with a further five million involved as volunteers. Uncertainty was the key issue raised in both the annual ProBono Australia's survey of the not-for-profit sector and the PwC-CSI Community Index with many in not-for-profits concerned about the future of their organisation over the coming 12 months. There is a shift towards taking control of the sector’s future by better leveraging its $175 billion assets. 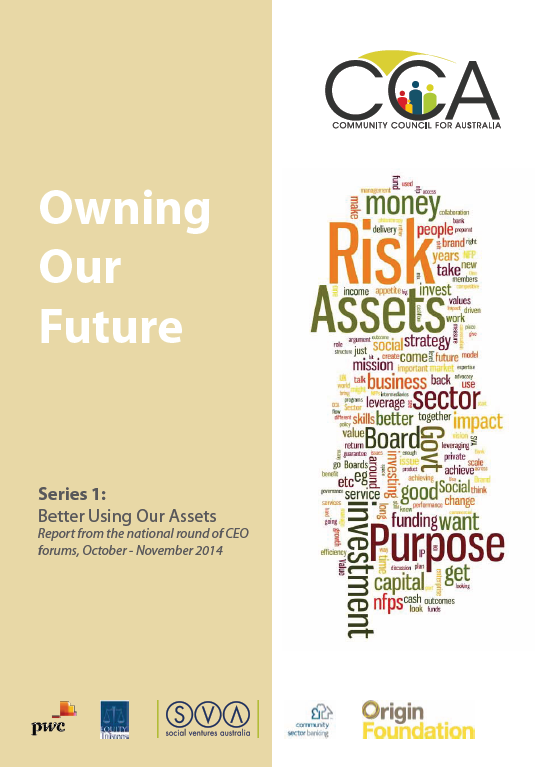 CCA, PwC, Community Sector Banking, Equity Trustees, Social Ventures Australia and Origin Foundation together rolled out the first round of forums to discuss this matter in the CCA Owning Our Future Series. Over 100 sector leaders joined experts to work through barriers and opportunities to unlock the potential of sector assets, both at organisational and broader policy levels. ons to achieve their purpose and access new avenues of funding outside of government. ‘Big issues include risk management; strategy focused on organisation purpose and mission today and in five to ten years time; collaboration and mergers; and the need to communicate value and diversify income streams,’ said Crosbie. ‘It’s a report that we hope will stimulate thinking and discussion within organisations, within the sector and at a national policy level,’ says Crosbie.